Put on your snowshoes and enjoy 30 km of marked trails that will take you to breathtaking points of view on the park islands and on the magnificent St. Lawrence Estuary. 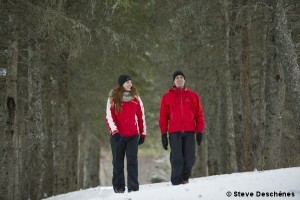 If you prefer cross-country skiing, explore less-travelled sectors of the park on 20 km of ungroomed trails. You don’t have the gear? No worries: on weekends, you can rent snowshoes or even a kicksled if you want to try a new type of gliding activity on hard-packed groomed trails. You will find refuges along the trails where you can take a break to have a snack and warm your cold fingers and toes near the wood stove. That will give you a second wind to pursue your adventure! The park also has a series of discovery activities during the winter. The “Joues Rouges” treasure hunt and a geocaching activity are offered on a continuous basis from mid-January until the snow thaws for the pleasure of young and old alike. Dress warmly, and explore the park looking for geocaches and answers to the list of the treasure hunt’s questions and clues. You can get that list at the reception. An introduction to geocaching is also offered if this is a new activity to you. When it comes to the magic of winter, few things rival with a walk under the moonlight. Once a month, from January to March, a night hike gives you an opportunity to see the park under the full moon light with family and friends. After your hike, warm up around a campfire, savouring a hot chocolate or roasting marshmallows. Moreover, on February 20th, you can start the night enjoying the famous crepes of a local restaurant to boost your energy before heading on a 5-km group hike to Pointe aux Épinettes where you will admire the full moon’s reflection on the floes. If you have a sweet tooth, you don’t want to miss the maple taffy on snow activity organized by the park staff on March 6th. Here’s a great opportunity to combine a great hike in the crispy winter air and a classic stimulation of your taste buds. The scientific minds among you will not be left aside. The astronomy club of Rimouski organizes an astronomy night in the park on March 2nd. It’s the perfect occasion to introduce yourself to this fabulous world and to learn more about constellations, the celestial concave and the solar system. To maximize the fun, you can spend the night in the park, even in winter! 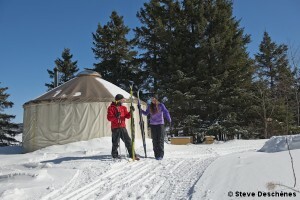 The most hardened ones can opt for winter camping, while those who prefer some coziness will love the unique experience of spending a night in one of the eight yurts in the park. Fully-equipped and located some 1000 meters from the parking lot, the yurts offer the perfect set-up to spend the night with complete peace of mind. There are two new lodging options in the park this year: Chalet de l’Abbé, a cabin with no running water, and Camp rustique Le Rioux, a rustic shelter with no drinking water. You can access these facilities located in the heart of the park on skis or snowshoes. From the parking lot, it’s 4 km to the cabin and 5 km to the rustic shelter. Why don’t you come around this winter and discover this true gem that is Parc national du Bic? Have a look at the park’s info and inquire about the winter programming when you book your stay!